The Marine Optical BuoY (MOBY) is a NOAA funded project to provide vicarious calibration of ocean color satellites (SeaWiFS and MODIS) (Clark et al., 1997). 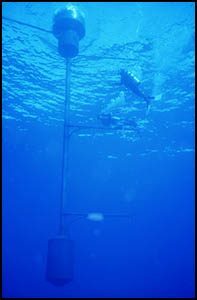 MOBY is an autonomus optical buoy which is moored off the island of Lanai in Hawaii. The system was designed for measuring sunlight incident on and scattered out of the ocean. These measurements are provided in near real time for the vicarious calibration procedures conducted by ocean color scientists. The development of MOBY began in 1985, followed by deployments of prototypes; first in Monterey Bay (1993) and then in Hawaii (1995). The operational version was tested in the fall of 1996 in Hawaii, and MOBY became operational at the Lanai site in July of 1997. MOBY collects data on a daily basis. Moss Landing Marine Marine Laboratories (MLML) was selected through a NOAA grant process to participate in the engineering and construction of the prototype and opertation version of the system in 1989. Additionally, MLML has had the primary responsibility for maintaining, calibrating the buoy and data production of the system. The intent of this site is to provide the background information associated with the system and a complete documentation of the data products and parameters collected during the operational period. A complete description of the system and product derivation can be found in the Papers and Posters Link. The photo gallery will document some of the operations and personnel involved in this project.